shelly's summary: Rainy Day Fun! Saturday was cleaning day at the casa de powers. Lets face it; it was raining what else do you do when it is a rainy yucky Saturday... and besides that we were headed out of town the next day and i can live in a "messy house" day to day but there is something about coming home from out of town to a "messy house" that i can't handle... sends me over the edge. So we cleaned and this was the kiddies idea of helping! Can't complain when they want to help right? We have the cleanest kitchen table in town! 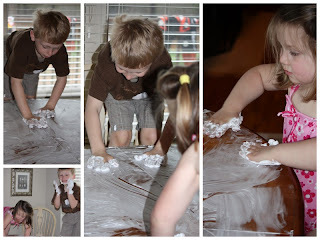 For all you none teachers out there shaving cream on a table will be fun and clean all at the same time. Yes, brylee is in her bathing suit... don't ask this was outfit change number 999 of the day.